Winner/Colome Legion baseball team has made it to the final four of the State B Legion tournament at Leahy Bowl in Winner. 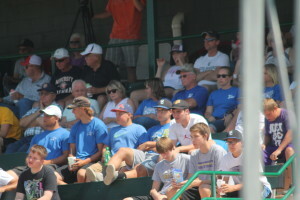 The Royals played Vermillion Monday night for the right to advance to the state championship. On their way to the final four, Winner/Colome defeated McCook/Miner and Platte-Geddes and lost to Spearfish. In the Royal’s first game on Friday night, they defeated McCook/Miner 5-3. A three run first inning set the Royals up for the victory. The team had seven hits with Riley Calhoon having two singles and Carter Brickman had two RBIs. Pitching for Winner/Colome were Carter Brickman who threw 4 1/3 innings to earn the win, giving up 3 runs on 5 hits, 2 walks and no strikeouts. Kelly O’Bryan earned the save in relief pitching 2 2/3 innings giving up no run, o hits 1 walk and 1 strikeout. Saturday Spearfish shut out Winner/Colome 10-0. Winner/Colome had 5 hits and O’Bryan had 2 singles. Ty Bolton threw 2 1/3 innings and gave up five runs on 7 hits, 8 walks and 1strikeout. Drew DeMers threw 1 1/3 inning and gave up 3 runs on 3 hits, 1 walk and 1 strikeout. Levi McClanahan threw a third of an inning. Cale Meiners threw two innings giving up 2 uns on 3 hits. The Royals bounced back on Sunday as they defeated Platte-Geddes 10-5. The Royals got a nice cushion as they scored several runs in the opening inning. Winner/Colome had 10 hits. Calhoon, McClanahan and DeMers all had 2 hits and nick Lantz had 2 RBIs. In pitching, O’Bryan threw one inning, Calhoon threw 6 innings in relief to get the win and give up five runs on 5 hits, 2 walks and 2 strikeouts. “It’s been a great three days so far for our guys and feels special to still be alive in the final four with so many great teams here,” said coach Drew Weber. “We beat McCook/Miner in a thrilling game on Friday night with some great pitching by Carter and Kelly and we got some timely hits from our entire order,” said the coach. “The Spearfish game didn’t go as planned but we bounded back with a hard-fought victory over Platte on Sunday. So far, I’ve been very impressed with our pitching and defense but our offense has come through with some clutch hits too. We’re not sure how it’s going to end up but we have already proven we are one of the best teams in the state and I’m very proud of our kids,” said Weber. On Monday, Spearfish played McCook/Miner in the 5 p.m. game and at 7:30 p.m. Winner/Colome took on Vermillion. The championship was played at Leahy Bowl on Tuesday, July 25. Be sure to follow the Winner Advocate for all the pictures and the latest scores from the Winner/Colome Royals.